UU’s Mykee Holtz (pictured) blasted a two-run homer in Saturday’s first game. 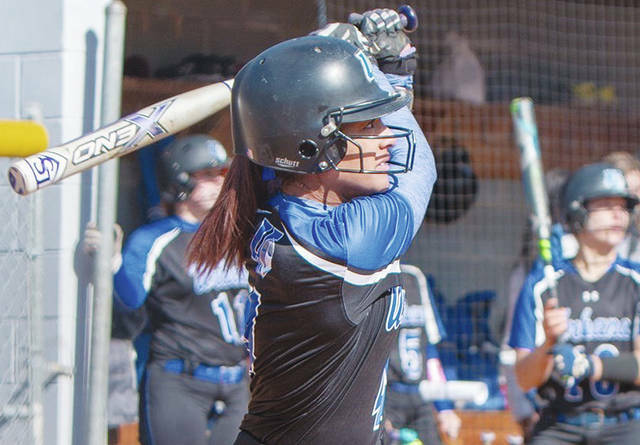 Urbana University softball captured its third win in a row before splitting Saturday’s doubleheader with a pair of one-run games against first-place Shepherd. UU took the first game at Blue Knight Field, 6-5, while the visiting Rams claimed a 6-5 victory in the second matchup. UU won a nail-biter 6-5 against the visiting Rams. Freshman Kayleigh Pate had another strong outing in the circle, going seven complete innings. Shepherd got on the board early in the first inning but sophomore Mykee Holtz blasted a two-run shot in her first at-bat, giving UU the lead in the bottom of the frame. Then, the Rams responded by adding two more runs in the top of the second on a two-out single to center field for a 3-2 lead. Senior Bri Bamber, who put together a strong day at the plate, got another rally with a double but the Blue Knights failed to capitalize. It wasn’t until the sixth inning when the SU pitching staff began to fall apart. Multiple walks in the inning led to a huge inning for UU with four runs to grab the lead, 6-3. Things got interesting in the seventh as Shepherd mounted a comeback attempt. With one out, the Rams moved the tying run over to third. However, junior right fielder Jenna VanHoose caught a shallow fly ball and gunned down the potential tying run at the plate for a thrilling double play to end the game. The two teams played another close one in Game 2, but this time SU plated three runs in the sixth to hold on for the narrow triumph. UU overcame an early deficit and got on the board with three runs in the third to claim a 3-1 lead. Holtz kept her streak going at the plate with a two-out, two-run single to plate Margo Jackson and VanHoose. The visitors tacked on a run in the fourth as UU held on to a 3-2 lead through five innings. Blue Knight pitchers Jade Laviolette and Carly Allen tossed a solid seven innings, allowing only two earned runs on eight hits. Unfortunately, SU was able to push three runs across in the sixth inning to capture the lead for good. UU scored in the final at-bat after a lead-off triple from Bamber, but UU could not sustain the momentum. On Sunday, UU was swept at home by Fairmont State, 10-3 and 8-0. UU now sits at 6-28 overall and 4-14 in the MEC. https://www.urbanacitizen.com/wp-content/uploads/sites/36/2018/04/web1_uusoftball.jpegUU’s Mykee Holtz (pictured) blasted a two-run homer in Saturday’s first game.